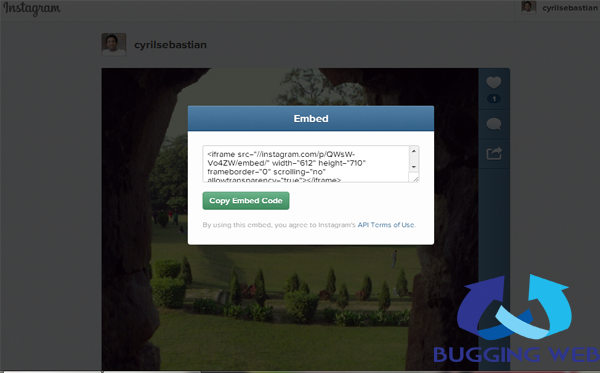 Share Instagram Images on your Site with Web Embed. With the popularity of the Instagram, it is adding new features and giving more options to share your Images and recently added mini video clips on your website and blogs. With love of users sharing their images on Instagram, it seems that Instagram is also taking its efforts hard for complete sharing of images on the web. Flickr was the majorly used to source the images on web, but by adding this feature in Instagram it will give more options of stock images for free. Related Post: Best 4 ways to use Instagram mobile app from your computer. From now on whenever you open a Instagram profile on your Desktop or Laptop you will get a share button which help you to get the embed code which can be added to your website or your blog. Since Instagram has good tools to edit the image and add different shades to the images, these images will be shared for free. You now do not have to buy or sell images from any other source. With active 130 million users on Instagram, sharing of the images with online public will make Instagram more popular. You do not need to worry if your content is private as these image will be available only from users who have shared the images publicly. You can have more options to your images search than your regular Google or Flickr search. Another reason to add this feature is to compete with Vine which is backed up by Twitter. Video recording for 15 seconds and share it like photos was recently introduced by Instagram which is similar service like Vine. Instagram was acquired by Facebook, and is trying to give its app a real-time approach to share free images on Internet. Related Post: Do you know browsers make money when you surf Internet. The concern is that, users who has shared their images publicly might get the credit for their picture but the Instagram owns the full database of users Photobucket. And at the end of the day, Instagram will be monetizing with its services and will not be sharing anything with its users. If you like this blog please follow us on Twitter @buggingweb, like the Facebook page and add us in your Google Profile for more updates.